Daisy was a happy little unicorn pony living in a strange pocket dimension populated with similar happy little ponies. One day a rift appeared in this dimension and from the sky rained unfriendly armored wolf-like creatures intent on making a meal and slaves of the equine residents. Daisy was the first to take arms against the invaders, using her magical telekinesis to snap one of the creature's necks. She then comandeered it's armor and led her fellow ponies in rebellion, driving the feral beasts back where they came from. This once peaceful pony found herself a stranger in her own dimension, having been tainted by violence, which was once an alien concept to her kind. With a heavy heart, she left through the rift and ended up in a strange universe where she now hires herself out as a mercenary, using her black core armor and weaponized magics to make her services worth every credit. 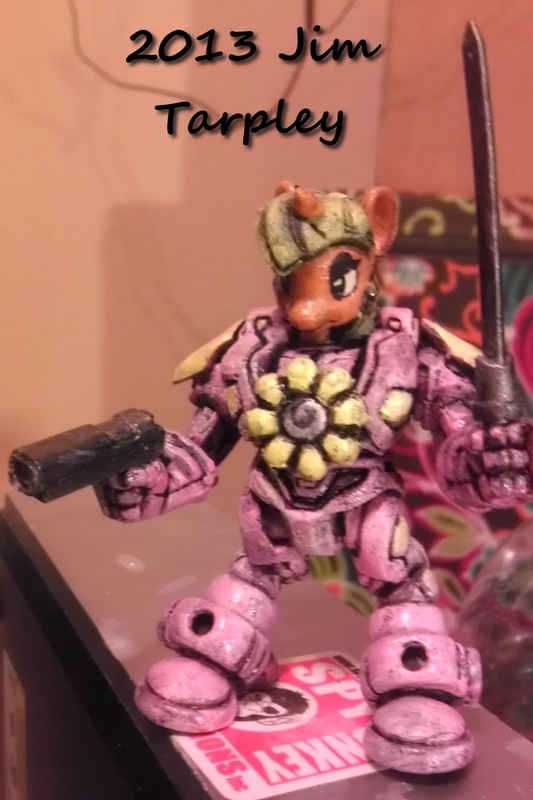 Made from a Glyos Armorvor and a MLP blind bag unicorn pony. Hand painted and clear coated.